In February our class met with a wonderful musician; Barry Singh, from the Tweed Coast. He has been struggling to get the off the ground for some years, sure they have been up and running and if you have just been to check the web site out you would have noticed they are definitely sizable, talented and working hard. Well what is their problem you may well ask, as we did, it seems they would like to keep a strong and steady stream of people attending their concerts. They want (like all of us) to attract the younger generations and get their custom as well as keep their die-hard followers of years past. This is where we come in to play, as a class we were allowed to question Barry and ask what has been done before and what was not even attempted, it seems nearly everything was tried, at least once. That left me asking why only once, maybe people are seeing this orchestra as unpredictable and unreliable because they seem to be trying so many things once. 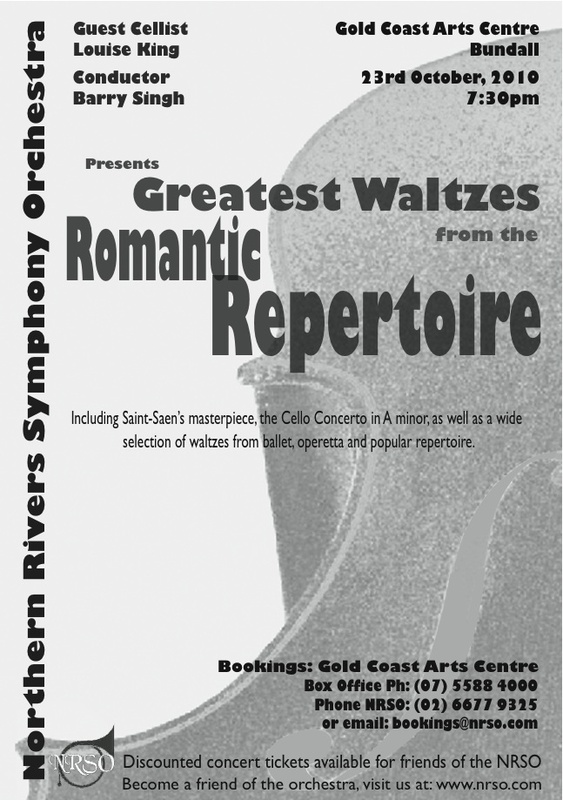 For an orchestra they seem to have little or no rhythm when it comes to advertising, promotion and style, it occurred to me that they should be looking at the whole problem from a musical point of view. People want consistency, reliability and stability, without that what is there left? Sure they might not turn up to one concert, but they could go to the next 9 in the year because they can rely on the time of day it is on, they feel safe in trusting it will be in that same venue and they heard that the last concert, at that venue, at that time of day – even if they are not sure of the name – was great and they will be there. 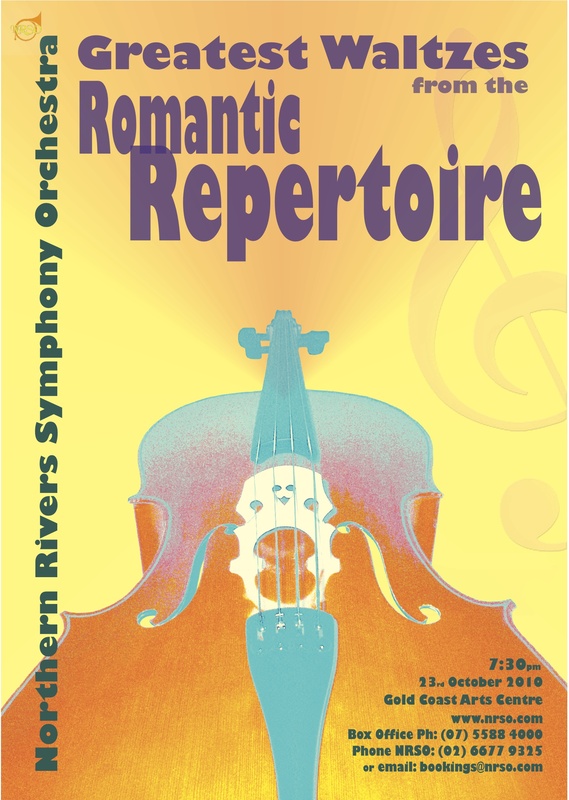 As we are designers and the orchestra wanted, more then anything, to attract the younger generations it was asked of us to design promotional materials for up and coming concerts or for the orchestra itself. At least that way the orchestra would not have to pay someone else to do it, so it would be more money in the musicians pockets at the end of the day. One of our classmates (http://Susan Charlotte.woprdpress.com) did come up with an original idea – promotional postcards – we did learn about the prowess of the promotional postcard last year but it was great to see Susan Charlotte took it on-board, applied it to the needed task and did a ripper of a job while she was at it. I designed along a theme, they have a real concert coming up with a wonderful Cellist – Louise King – as a guest so I used it as a leaver and worked on a newspaper ad, flyer, poster and tickets for this particular concert. To attract the young-uns I took a photo of a ‘cello (being lucky enough to have a cellist in the family) and livened up the colours to match the mood of the music which is scheduled to be played at this concert. I really hope Barry likes my work enough to use the set and I will be happy enough to supply him with any other bits and pieces as needed, at least it will save Barry a buck or two, and provide me with experience as it was a project I thoroughly enjoyed.